After traveling to Everest Base Camp with the fall trekking team, Denio and Raquel will continue on to climb Lobuche Peak, a stunning glaciated mountain that stands at 20,076ft/6,119m. 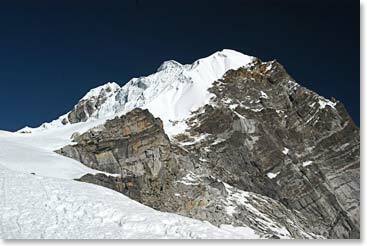 From the summit, they will be rewarded with incredible views of the surrounding peaks including Everest, Lhotse, Makalu, Ama Dablam, Pumori and Nuptse. Follow along as they quest for the summit of this beautiful peak. October 26, 2011 – The Team Reaches the Summit!